Amir Hossein Abolfath was born in 1983 in Tehran, Iran. His passion to astronomy since childhood led him to make his first astrophoto in 1992 when he was a student in an educational observatory in Tehran. In 2004 he started digital astrophotography by traveling all across his homeland country to find unique historic and natural locations and attractive celestial configurations. He is a talented amateur astronomer, astrophotography educator and innovative photographer with special interest to time-lapse videos and virtual reality all-sky images of the night sky. Many of his photos are appeared in Iranian astronomical and tourism magazines, while some of his images are published internationally including on NASA’s website and calendar. His 2008 image of Iran Messier Marathon has published in the March 2010 issue of National Geographic, as one of the first astrophotos in Your Shot section of the magazine. 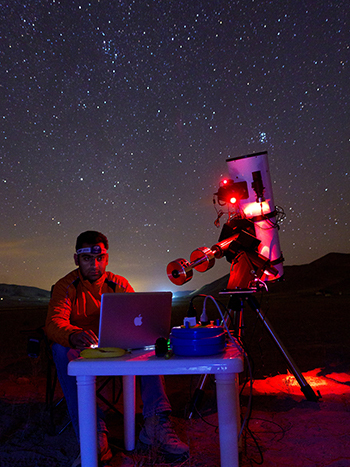 Amir is a dedicated astrophotographer and a ready to go traveler, whenever there is something new in the sky.